Red Robin’s birthday deal is valid during the entire calendar month of your birthday. Wouldn’t it be cool to celebrate your birthday all month long? If you play it right, you can get free meals, free drinks, free appetizers, and free desserts – yes, we said free desserts! Birthday freebies are out there if you are willing to do a little research. Lucky for you, most of the hard work has already been done with this list for restaurants that offer free birthday meals. You can search by restaurant name and find free birthday stuff. Long ago you could get a free birthday deal from many restaurants if you went in on the day of your birthday and showed your driver’s license. If you wanted to enjoy several birthday deals you’d have to go from restaurant to restaurant all on the same day. A person can only eat so much. At some point it would stop being fun. Those times have changed. Today the majority of your favorite restaurants have birthday coupons, deals, or specials that are valid anywhere from seven days to your entire birthday month. To get these deals you will need to go online and sign-up before your birthday. After sign up, most of the restaurants will send various specials, coupons, and deals not just for your birthday, but throughout the year. To get the most out of your free birthday deals there are a few things you can do. It takes a little planning and organization, but when you can eat free your entire birthday month, it’s definitely worth it. Follow these tips for best results. Set up a separate email account. – There are plenty of free email services like Gmail, Hotmail, Yahoo, and AOL. You want a separate account so that you can keep your birthday deals organized and they don’t get lost in your regular email. Set up separate folders for each restaurant so you can put the correspondence in there. You can also create a folder just for your birthday deals. As you receive them, move them to that folder. As you use them, delete them or move them to another folder. Sign up for birthday deals. – There are several ways to find birthday deals for your favorite restaurants. You can check their website or you can ask your server when you go there. You can also use this handy Restaurant Birthday Deal Finder and just plug in the zip code, city and state, or province. Read the terms. – Make sure that you read the terms of your deal; read the fine print. Find out if there are any restrictions or if you have to call ahead of time. Create a file and map the restaurants you will visit to celebrate your birthday and note these terms so you won’t have to waste time searching. Check your email. – Usually the offers will start coming in around four to six weeks before your birthday. Make sure you check your email at least daily so you can review the offers. Organize your deals. – As they come in, note them on your file, along with the address, the birthday freebies they offer, and any special terms or restrictions. Once you have completed your list you can map out an entire birthday month of free drinks, meals, and desserts. Present your coupon. – Present your coupon to the server before you order, not when the check arrives. This is to verify that everything is OK. You don’t want an uncomfortable scene if something is awry; especially if you are celebrating. Different restaurants have different deals. Here are a few to get you inspired. Appetizers – Joe’s Crab Shack will give you a free appetizer when you sign up for Joe’s Catch. The Nut-E Club at Logan’s Roadhouse also gives members a free appetizer for their birthday. Sign up for Rainforest Café updates and get a free appetizer for your birthday (and don’t forget to get the chocolate volcano for dessert!). Moe’s eclub gifts you a free entree on your birthday and 10 days to use it! Moe’s Southwest Grill by Mike Mozart, CC-BY-2.0. Entrées – Welcome to Moe’s! And get a free Moe’s birthday entrée when you sign up. If burgers are more your thing, why not have a Red Robin birthday? 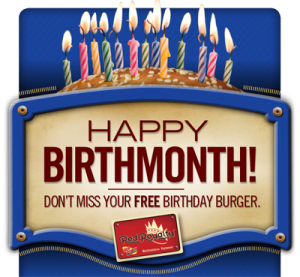 Just sign up for the Red Robin Royalty Club and get a free burger when your birthday rolls around. Party like a rockstar, a birthday party that is, at the Hard Rock Café with a free entrée from their menu. Enjoy a free birthday sandwich of your choice, on Scholtzsky’s, when you join their Lotz4Me Guest Rewards. Desserts – Who wouldn’t want to have a Dairy Queen birthday? Sign up for the Dairy Queen Blizzard Fan Club and get a free birthday Blizzard. The Longhorn Steakholders Club at Longhorn Steakhouse also offers a free birthday dessert to its members. Check out birthday freebies at Sprinkles and get a free cupcake. Snacks – Auntie Anne’s Pretzel Perks will get you a free pretzel for your birthday plus they send other great deals and free stuff throughout the year. Sign up at Baskin Robbins and get a free scoop of ice cream – and birthday ice cream is always the best. Buffalo Wild Wings’ Blazin Rewards offers its members lots of cool perks including a free snack size wings on their birthday. 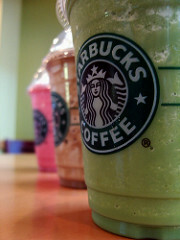 Starbucks Frappuccino Triad by Basheer Tome, CC-BY-2.0. Drinks – Celebrate your birthday with Club Cinnabon and get a free MachaLatta Chill drink. The DDPerks Rewards Program at Dunkin’ Donuts gives pretty awesome deals to members including a free birthday drink, but other great stuff too. Join Starbucks Rewards and get a free drink or food item on your birthday and other free stuff and exclusive deals during the year. Breakfast – Join the revolution, the Pancake Revolution, that is, at IHOP and get a free stack of Rooty Tooty Fresh ‘N Fruity pancakes to celebrate your birthday. Denny’s Rewards offers members a free Grand Slam birthday breakfast. Choose Waffle House for your birthday breakfast and enjoy a free waffle when you sign up for their Regulars Club. Way Cool Stuff – There is nothing, nothing like a Medieval Times birthday! Medieval Times gives you a FREE four course meal and show! Scroll down to Join the King’s court and enter your preferred castle and your email address. When you join the Golden Corral Good as Gold Club you’ll get a free buffet for your birthday. Plus, you can add your spouse and children on the same membership. Get a free box of chocolate covered strawberries for your birthday when you sign up with Melting Pot. What is the deal (entrée, dessert, drink, etc.)? How long is the deal good for? Are there any terms, restrictions or limitations? If so, what are they? Do you have to make reservations or call ahead? Now all you have left to do is start searching for your birthday deals and sign up. Do it now and your next birthday will be absolutely amazing all month long.